* Share price as of close on January 15, 2014. Shares outstanding at the end of the most recent quarter exclude treasury shares. ROE is based on previous full year's results, while BPS current first half results. This Bridge Report provides details of Nihon Enterprise Co., Ltd. and its first half of fiscal year May 2014 earnings results. Nihon Enterprise is a "mobile solutions company," with two main business segments including the Mobile Content Segment, where various contents including lifestyle and traffic information services are created and distributed to smartphones and other mobile devices, and the Solutions Segment, where contents creation, operations, systems creation, affiliate advertising, reverse auction, and IP-PBX solution (Cost reducing) are provided. Furthermore, Nihon Enterprise is also promoting efforts to expand its business into overseas markets including contents provision in China and India. The Nihon Enterprise Group is comprised of seven consolidated subsidiaries including the company Dive Co., Ltd., which provides advertising services, LOUNGE Co., Ltd., which provides music related services, Advanced Traffic Information Services, Corporation (ATIS Corp.), which provides traffic and other information services, 4QUALIA Co., Ltd., which provides web and mobile site development and maintenance services and contents development, Enterise (Beijing) Information Technology Co., Ltd., which operates cellular telephone retail shops in China, Beijing YZH Wireless Net Technology Co., Ltd., which provides mobile contents planning, development and solutions, Rice CZ (Beijing) New media technology Co., Ltd., which provides IT related educational services. The Group also boasts of another three non-consolidated subsidiaries including and One, Inc., which provides voice communications related solution services, Rise MC (Beijing) Digital Information Technology Co., Ltd., which provides mobile contents distribution and character licensing services, and NE Mobile Services (India) Private Limited, a local company operating in India. Efforts responding to changes in the mobile environment accompanying a shift from feature phones to smartphones are being promoted both within and outside of Japan. 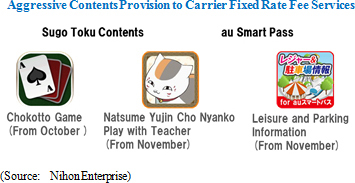 Within Japan, efforts to develop responses to the new age of smart devices that lead to expansion in the contents services and solutions businesses including alliances with cellular telephone sales companies, provision of in-house contents to mobile communications carrier for their flat rate and unlimited usage services (au Smart Pass, YAHOO! Premium, Sugo Toku Contents), establishment of reverse auction as a commercial solution (Nihon Open Market) and IP-PBX solution deployment are being implemented. At the same time in overseas markets, efforts are being made to establish business foundations in China and India, countries which boast of large populations and strong growth potential. As part of these efforts, Nihon Enterprise endeavors to promote digital comic distribution and cellular telephone sales businesses are progressing smoothly. Furthermore, the rapid diffusion of smartphones and tablets is acting as a tailwind for the distribution of digital publications (Distribution services using iPad applications was launched in December 2011 through an alliance with India's lifestyle magazine company called MAGNA) in India. Sales rose by 3.0% year-over-year to ¥1.035 billion. By business segment, sales of the Mobile Content Segment rose by 18.7% year-over-year to ¥613 million, while sales of the Solutions Segment declined by 13.5% year-over-year to ¥421 million. In the Mobile Content Segment, an expansion in contents sales (Monthly fees) via cellular telephone carrier fixed rate fee services and alliances contributed to increases in sales of traffic information, lifestyle, E-book, and games. At the same time, temporary declines in sales incentives (Suspension due to complete depletion of budgetary allowances) contributed to a decline in cellular telephone sales in China, and the launch of sales of iPhone 5s/c by NTT Docomo contributed to declines in advertising sales (shop affiliations: contents sold on a performance based by collaborative cellular telephone companies). With regards to profits, an increase in the sales mix of highly profitable contents services business contributed to a 0.4% point improvement in gross margins and allowed gross income to rise 10.9% year-over-year to ¥517 million. At the same time, higher expenses for advertising, overseas business deployment, and increased development staffing were also absorbed and allowed operating income to rise by 3.1% year-over-year to ¥100 million. Sales rose by 14.0% year-over-year to ¥2.174 billion during the first half. By business segment, sales of the Mobile Content Segment and Solutions Segment rose by 19.7% and 7.8% year-over-year to ¥1,193 and ¥981 million respectively. Increases in the number of users resulting from expansion in sales of contents through alliances and fixed flat rate fee services of carriers contributed to a 35.4%, 23.0%, 89.2% and 192.1% year-over-year increases in sales of traffic information, lifestyle (Including "Josei no Kirei Rizumu" health supporting women's minds and bodies), E-Book, and games to ¥410, ¥214, ¥118, and ¥43 million respectively in the Mobile Content Segment. In the Solutions Segment, a decline in advertising sales (shop affiliations) due to temporary factors was compounded by lower sales of solutions resulting from seasonal factors despite strong inquiries. At the same time, the start of cellular telephone shop operations from the fourth quarter of the previous fiscal year (Contributing to booking of ¥160 million in overseas sales) helped to absorb these negative factors. Operating income declined by 15.6% year-over-year to ¥160 million. While improvements in the sales composition contributed to a 0.3% point improvement in cost of goods sold margins to 52.2% and a 14.6% year-over-year increase in gross income, strategic spending for adverting (Total advertising spending rose by 54.8% year-over-year to ¥209 million) relating to carrier flat fixed rate services within the Mobile Content Segment and increases in operational costs arising from the cellular telephone shop and from increases in development staff in the solutions business contributed to increases in sales, general and administrative expenses of 22.6% year-over-year to ¥878 million. Net income rose by 9.0% year-over-year to ¥132 million on the back of the booking of ¥107 million in extraordinary income arising from sales of marketable securities. Measures designed to capture customers shifting from feature phones to smartphones is progressing smoothly and as of the end of the first half monthly fees (Carrier monthly fee websites) derived from smartphones users accounted for 55% of sales in the Mobile Content Segment. Moreover, campaigns designed to acquire new customers launched during the New Year period was successful, with the number of monthly fee users exceeding 500,000. During the first half of fiscal year May 2014, Nihon Enterprise undertook endeavors to capture demand from smartphone users including the expansion of contents provided to carriers' fixed rate fee services (Including 2 new contents for au Smart Pass, and 1 for Sugo Toku), and iPhone versions of various contents provided to NTT Docomo's smartphone portal site "d-Menu". Moreover, Nihon Enterprise also endeavored to fortify and expand its smartphone applications. With the goal of achieving 2.0 million downloads by the end of the current term, the Company has implemented measures to increase its global applications (Versions in multiple languages) leveraging its increased brand recognition including "Woman's DIARY" that supports women's minds and bodies, and facilitate its operating environment to allow for greater monetization of various applications. New smartphone applications including the "Fivetalk" messaging application for smartphones and "Komyukara" community social applications have been newly introduced. At the same time, in the Solutions Segment Nihon Enterprise saw an increase in projects (Smartphone development) for corporations due in part to an expansion in shop affiliations and test marketing done in collaboration with the new partner the "Tokyo Bookshop Group," despite a temporary decline in advertising (shop affiliations) sales resulting from the launch of iPhone 5s/c. Measures designed to deal with the decline in advertising (shop affiliations) sales, including fortification of existing collaborative relationships and expansion in sales channels, are being implemented. In addition to fortification of support of cellular telephone sales companies (Existing collaborative partner companies) and test marketing by new collaborative partner book stores (Tokyo Bookshop Group), cultivation of new partners in other industries and new cellular telephone sales companies is also being promoted. In addition, efforts are being made to promote the cultivation of new businesses including joint business (Collaborative contents), reverse auction (Cost reduction services), and IP telephone services. With regards to the joint business (Collaborative contents), Nihon Enterprise is collaborating with SANRIOWAVE CO., LTD. to begin providing the game application "Run-Run Hello Kitty" (Free of charge with the exception of some portions of the game) to "d-Game" (NTT Docomo's game provision service in collaboration with major game companies) as part of the strategy of capturing the growing market for women's games and as a means of reducing its dependency upon card games. "Run-Run Hello Kitty" is also expected to be provided to new platforms from January 2015. At the same time, the increased recognition of the reverse auction contributed to an increase in the number of contracted buyers using the auction from 11 companies at the start of the service in February 2013 to 53 most recently. Nihon Enterprise maintains a target of achieving 80 contracted buyers by the end of the current fiscal year. Furthermore, the Company will cultivate new corporate users by leveraging the voice communications software development technologies used in the IP telephone services of its subsidiary "and One Inc."
The specialized reverse auction portal site "Nihon Open Market" (http://www.open-markets.jp) was opened in June 2013. "Nihon Open Market" is the industry's only portal site specializing in a reverse auction that enables companies (Buyers) to complete transactions with superior Japanese merchants (Suppliers) in an open system. Earnings are derived from usage fees charged to buyers using the reverse auction (Profair), and monthly membership fees charged to suppliers of Nihon Open Market (¥3,000 per month). In addition, an internal and external telephone call system based upon a single smartphone using "and One's" IP-PBX software "Primus" has begun being provided in the IP telephone services realm. Reductions in communications costs and improvements in operational efficiencies can be achieved by creating a messaging application that leverages a highly secure closed environment. 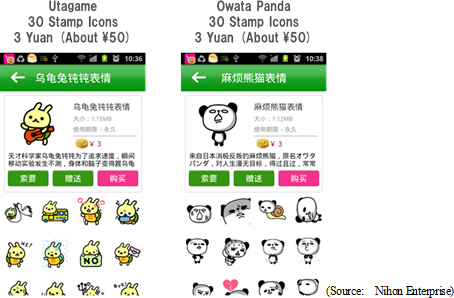 China Telecom affiliated cellular telephone shops saw temporary declines in cellular telephone sales, but an expansion in distributors of the Digi-Comic "JiuDingJi" was recorded and the provision of stamp icons "Utagame" and "Owata Panda" in WeChat and weibo of China Mobile's Comix-Award Expression were also started. In the Mobile Content Segment, distribution of the digital comic "JiuDingJi" has been expanded from "Mobile Comix" of China Mobile's (China's largest cellular telephone carrier) to include "Love Comix" of China Telecom (China's third largest cellular and largest fixed line telephone carrier) and "Rich Comix" of China Unicom (China's second large cellular telephone carrier). In addition, distribution has also been expanded to include general non-carrier platforms including "Tencent Comix" operated by Tencent Inc., a major Chinese IT company. Collaboration with major magazines for the introduction of two new titles is undergoing preparation (Distribution of these new titles will begin in major magazines, but preparation for digital distribution has already been completed.). Furthermore, provision of stamp icons "Utagame" and "Owata Panda" for a fee to be used in WeChat and weibo on China Mobile's Comix-Award Expression has begun. Moreover, "WeChat" is a communication application provided by Tencent Inc. to smartphones. This application allows users to converse and chat with each other free of charge and boasts of over 600 million user accounts. In addition, "weibo" is a term representative of social media in China, and is also known as the Chinese version of Twitter. Amongst the most popular weibo are "Sina Weibo" operated by SINA Corporation and "Tencent Weibo" operated by Tencent Inc. The total number of weibo accounts exceeds 1.3 billion (According to Nihon Enterprise data). In the Solutions Segment, cellular telephone sales at China Telecom affiliated cellular telephone shops suffered a temporary decline due to halt of sales incentives from the carrier. This halt of sales incentives is attributed to complete depletion of budgetary allowance for sales incentives by China Telecom. But along with the sales launch of iPhone 5s/c, China Telecom has started to pay new sales incentives from the latter half of November. Therefore, sales volumes of cellular telephones declined during the second quarter (July to September), but they have begun to recover during the third quarter (October to December). Also, China Telecom is expected to strengthen its sales strategy in response to intensifying sales competition brought on by the launch of iPhone sales by cellular telephone carrier industry leader China Mobile during the fourth quarter. In the alliance with China Telecom and Nihon Enterprise's local subsidiary, the first cellular telephone shop "Dongfang Road Shop" was opened in December 2012, and the second shop "Huangjincheng Avenue Shop" was opened in April 2013 (Both shops located in Shanghai City). Because this subsidiary completes its fiscal year at the end of December, provisional accounts as of the end of March are used in the creation of financial accounts and adjustment of major transactions to account for the differing fiscal year ends of the consolidated fiscal year end are used to create consolidated accounts. Total assets declined by ¥408 million from the end of the previous fiscal year to ¥4.660 billion at the end of the first half of the current fiscal year. The decline in total assets is attributed to sales of a portion of marketable securities and payments for dividends and corporate taxes. This strategy of reducing the size of the overall balance sheet contributed to a 4.5% improvement in equity ratio to 79.8%. No changes have been made to estimates for sales, operating and ordinary incomes, but net income has been revised upwards due to the occurrence of extraordinary income arising from the sales of marketable securities. In the Mobile Content Segment, contents sales via fixed rate fee services of carriers and alliances is expected to grow and the effect of the growing number of aggregate contracts is also expected to boost sales. In the Solutions Segment, the recovery in cellular telephone sales and efforts to fortify collaborative endeavors in advertising and to expand sales channels are expected to positively influence earnings. With regards to profits, improvements in gross margins resulting from changes in sales composition and effective advertising spending are expected to lead to further improvements in profitability. A dividend of ¥2 per share is expected to be paid at the end of the term. Meanwhile, Nihon Enterprise conducted a 100 for 1 stock split on December 1, 2013 with the shift to a unit share system that sets one share-trading unit as 100 shares. Consequently, the dividend payment actually represents a ¥20 increase to ¥200 compared to the previous term and marks the second consecutive term of higher dividends. At the same time, the upward revision to net income suggests that there is potential for further increases in dividends. An essential point of the management of Nihon Enterprise is its "focus upon in-house development," and the principle of distributing contents and applications developed in-house. While this policy is expected to contribute to increases in fixed costs, the booking of development expenses in each term that they occur allows increases in sales to directly lead to profits in future terms, and allows Nihon Enterprise to realize profits on projects that other companies cannot. Consequently, the effective leveraging of contents in carrier fixed rate services leads to a much larger positive influence upon earnings for the Company than its competitors. Furthermore, the wide variety of products including traffic information, Lifestyle, E-Book, games and other contents is very attractive to its users. Similarly, Nihon Enterprise's sales of contents developed through alliances boast of a cost structure that is superior to its competitors. Therefore, the business targeting smartphones is expected to continue to contribute to Nihon Enterprise's earnings in the future.